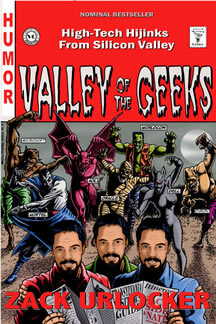 Valley of the Geeks - NEW: Buy the Book! Laugh so hard, you'll snort coffee up your nose. –Bruce Eckel, "Thinking in Java"
"Valley of the Geek is a fine antidote to high-tech's breathless 1990s culture and its subsequent unraveling." Order directly from iUniverse Publishing, Barnes & Noble or Amazon. Be the first on your cell block to get a copy for just $14.95 plus shipping. Secure online ordering. All major credit cards accepted. Fastest delivery direct from iUniverse! Plus new articles not available on the web! Over 8,000 extra vowels, free! Zack Urlocker is a pseudonym for a Silicon Valley executive rapidly approaching his mid-life crisis. He is the publisher of the award winning web site www.valleyofthegeeks.com. In his spare time, Mr. Urlocker is a marathon runner and digital piano tuner. He is married and has five computers.